Following the massive attacks of Conqueror Sultan Medmed II's troops, the Serbian states, one by one, came under Turkish rule, after the take-over of Carigrad in 1453. After the collapse of despotism (1469), the Kingdom of Bosnia (1463), and Hercegovina (1481), all Serbian lands, with the exception of Montenegro, which, shielded by impassable mountains, was able to hold off the Turks until 1492, found themselves under Turkish rule. The Serbian nobility which had migrated to southern Hungary, continued its fight for the re-establishment of despotism in the following decades, until, along with the Hungarian mobility, it, too, came under the Turks. The remainder of what was left of the feudal lords eventually converted to Islam in order to remain in possession of their estates. With the exception of the Church, which had managed to retain certain privileges during the first centuries under Turkish rule, the whole social hierarchy of the medieval Serbian state disintegrated forever in Kosovo and Metohija. Kosovo and Metohija, the central regions of the one-time state under the Nemanjic dynasty, had been occupied by Mehmed II before the fall of despotism. The Sultan had begun his campaign against Serbia with the attack on Novo Brdo, a rich mining town in Kosovo. In June 1455, the town was destroyed by a dreadful cannonade of Turkish artillery. The Sultan killed the town aristocracy, recruited 320 young men into janissary lines (janicari), and took 700 of the most beautiful women, and divided them among his soldiers as a prize. Shortly afterwards, the towns ofLipljan, Pri-ren, PriStina and Trepca were conquered as well. The sultan divided Kosovo and Metohija into administrative units, sanjaks (Turkish: "flags"). According to some accounts, numerous depradations with populations, massacred whole towns moved into Anadolia, and towns and mines destroyed left behind a sad, deserted sight. 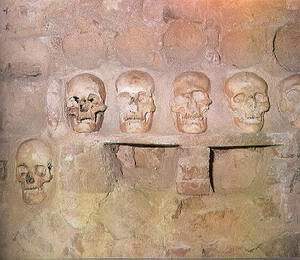 The taxes the peasantry paid to the Turks at the beginning of their rule were not much higher than those they had paid under the Serbian state; however, in time, the imposed taxes increased both in number and amount. The constant change in rule over the estates which were held by landowners (they could not be sold, or left to future generations), added to the worsening of the peasants' position. The landowners raised the taxes as time went by: instead of a tenth of an income, they asked for a ninth, then an eighth, and, in certain places, even up to half of the total income of these folk. Next to follow was "work-without pay (kuluk), duties paid in the form of food and material, contributions for the army in times of war and otherwise, lodging services... etc. A unique institution within the governmental system was the so-called institution of adiamioglan. Every five years, the Turks selected the best non-Muslim children from every nationality (with the exception of the Armenian and Jewish nationality) for the regular janissary army. This was known as "a taking of children as a tribute" (devsirma). A certain number of them, not only well-trained, byt also well-educated, instead of remaining in janissary units found themselves at the padishah's court. Serbs, who had taken to Turkish ways, soon found, and distinguished themselves among the sultan's pageboys, as well as escorts to high Turkish dignitaries. In the 16th century, the Serbian language was used officially, along with Turkish, at the Port. Many records, written in Cyrillic, have been preserved, and saying has it, that even Soleiman II understood Serbian. Mehmed Sokolovic, who later became a grand vizier, rose to the highest position among the Serbs who had adopted Turkish manners, and risen to places of importance in the Turkish Empire. It was through his efforts that Soleiman II the Legislator issued a decree (berat) regarding the re-establishment of the Patriarchate in Pec. Makarjje Sokolovic, a relative of the vizier, was appointed patriarch. The re-establishment of the Patriarchate, which had been in a vassal position under the Sultan, opened up the possibility for the occupant's establishment of theocratic rule. Reaching past the borders of Austria and the Republic of Venice, almost all Serbian lands found themselves spiritually united under the jurisdiction of the re-established patriarchate. Through the efforts of the patriarchs in Pec, the Orthodox religion, with the cult of St. Sava at its centre, became the faith of the people, the embodiment of the historical and national tradition of the Serbs, in which was merged the whole of the spiritual heritage of this people. The Church became the vehicle for Serbian national ideology. The re-establishment of the patriarchate marked the revival of the spiritual life of the Serbian people. The regions of Kosovo and Metohija, abounding in monasteries and churches, once again became the center of Serbian national events. The highest of church dignitaries attended the conferences and councils organized by the patriarch in Pec. In the endowments of the sacred Nemanjic dynasty and their nobility, especially in Decani, Gracanica and the patriarchate, cultural art centers were revived. Learned monks copied old, as well as compiled, new hagiographies of Serbian saints. They also wrote and illuminated religious books. Painters worked on icons, while native masters painted new churches and parishes which had been added on to old monasteries. One of the first printing presses in the Balkans was set in motion in Gracanica. In 1641, the patriarch Paisius (1614-1647), originally from Janjevo in Kosovo, wrote the biography of Tzar Uros, the last of the Nemanjic dynasty. All national movements against Turkish rule began under the leadership of the church. In search of allies against the Turks, the Serbian church hierarchy, as well as the leaders of the people, continuously negotiated with the representatives of the Roman clergy. The Roman Catholics were willing to give their support under the condition that a religious union be formed, which the people and lower clergy were not willing to accept under any circumstance. The Patriarch Jovan (1592-1614) of Pec', seriously involved himself in diplomatic action, searching for allies who would aid in the struggle against the Turks. In 1594, the great uprising of the Serbs in Banat, was led by Bishop Teodore from Vrsac. The rebels put the image of St. Sava on their flags, which soon became the symbol of the people's resistance against the Turks. Consequently, the grand vizier Sinan-pasha (an Arbanas - Albanian by nationality) took the relics of St. Sava from the monastery of Mileseva and had them burned on Vracar Hill near Belgrade, on April 27, 1594. The defeat of the Turks by Vienna in 1683, marked the beginning of political upheaval and demographic changes on the Balkans. The army of Emperor Leopold, under the command of General Ennea Silvia Piccolomini, crossed the Danube and pushed back the Turks towards NiS and Skopje. The summons of the Emperor was responded to not only by the Austrian army, but likewise by many Serbs who had hoped that the hour for the liberation and revival of the Serbian state had finally come. 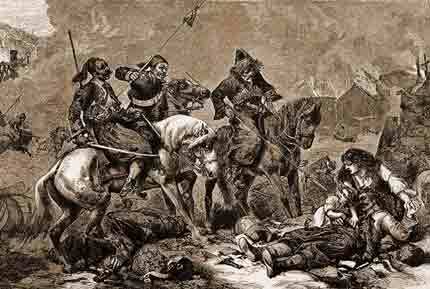 However, the Serbs soon came to be disappointed in the Austrians, and deserted their army. Many monasteries were destroyed in the war. In 1688, Osman Jegen Pasha robbed the monasteries of Gracanica and Pec Patriarchate of their treasures, carrying off money, and other valuables, on the backs of as many as nine horses. ! Patriarch Arsenije Crnojevic III (1674-1690) i entered into negotiations with the Austrians, i firm in his belief that the Turkish Empire was , directly facing its downfall. However, after the ., death of Piccolomini, and the defeat of the ] demoralized Austrian army at Kacanik, the ' patriarch, now having politically compromised himself, didn't dare await the Turks' revenge. The fatal retreat of the Serbs followed. The Turks' and Tartars' destruction of all before them, resulted in the migration of the people which, led by the patriarch, began its retreat towards Belgrade. With approximately 40,000 warriors, and as many exiled families, the ] patriarch crossed over into Austria. It was then 1 that many a town became deserted, and many a monastery was robbed in Kosovo, while those who had stayed behind were left at the mercy of the Turks', Tartars', and Albanians' cruel vengeance. The great migration of the Serbs into Austria in 1690 caused a significant demographic disturbance in Kosovo and Metohija. The Serbian people suffered greatly in the devastations which followed. The settlement of the Albanians in Kosovo and Metohija was to put their survival through even more trials. Until 1690, the Albanians, mainly those of the Catholic faith, comprised an insignificant part of the population. After the great migration of the Serbs, the Port began to encourage their settlement, fearing new movements by the Christian Serbs. The Port permitted the coming down of Catholic tribes into the flatlands of Kosovo under the condition that they converted to Islam. Already Islamized, the Albanians slowly^ cleared more space for settlement through use of force, theft, and constant devastation. The positions they occupied in the system of the Turkish state rose along with this. After the second migration of the Serbs in 1737, Albanians of the Muslim faith in Kosovo and Metohija, became the keepers of law and order. The Roman curia supported the strengthening of Catholic Albanian settlements in Metohija as well. Mainly of Albanian nationality, Catholic bishops from Skopje helped in the settlement of their fellow tribesmen and encouraged them in their attacks on the Serbian Orthodox population. From the middle of the 18th century, within the administrative apparatus of Kosovo and Metohija, all of the most important positions, up to the position of sanjakbey, were occupied by Albanians. The weakening of authority within the central government helped their rise to the positions of autocratic, semi-mde-pendent rulers, who managed the lives and estates of the Serbian population. With the shutting down of the patriarchate in Pec in 1766, the Serbs of Kosovo and Metohija lost the last national stronghold they had had. During the great onrush of religious intolerance at the end of the 18th century, a great number of Serbs, choosing between death and Islamization, chose conversion as a way out. It is then that the district of Gora near Prizren converted to Islam. At the beginning of the 19th century, the Serbs in Kosovo lived under extremely unfavorable circumstances. From Egypt to Janjina, and from Skadar to Vidin, the rule of the independent pashas slowly undermined the foundations of the Turkish state. It was again the Serbs who suffered most in the anarchy Turkish rule in Kosovo and Metohija had caused. Whole Serbian villages were mercilessly destroyed by the Albanian feudal lords, who insisted on Islamization, and who turned the few independent landowners into serfs (cifcije). The evacuation and utter extermination of whole Serbian villages at the time the Serbian state was undergoing revival in northern Serbia, resulted in migrations to neighboring parts, especially to Serbia, only to gain even more in intensity and dimension. The uprisings of the Albanians against the reforms the Turkish authorities organized from the middle of the 19th century, brought serious troubles upon the Serbian population. The merciless persecution of the Christians after the Crimean War (1853-1866), when the anti-Orthodox and anti-Slav policies of the Port reached their peak, brought about renewed extermination of many Serbian settlements in Kosovo and Metohija. The learned prior of the Monastery of Visoki Decani, Serafim Ristic, appealed to the European public in order to turn their attention to the intensity of Albanian and Turkish attacks upon the Serbs through his book, entitled "The Cry of Old Serbia" - "Plac Stare Srbije" (1864), dedicated to the pastor William Denton. In his appeal, sent to the sultan Abdul Aziz, in 1860, which is given in full in his book, the following is said: "Pec and the territory within its jurisdiction constantly moan under the indescribable whip of, and day to day rising maltreatment by the Albanians, without having given any cause, left to the mercy of God (...) All the injustice and evil done to the said territory, is centered around six villages, in which the Albanians, the bitterest enemies of Christ's faith, and the worst torturers of the poor folk, live (...) The Albanians do not only do what your Majesty has forbidden them to by law, which they do not in the least respect, but, moreover, encourage other neighboring fellow countrymen to torture, molest, and kill the poor people, in which they have been exceedingly successful." Unable to help its fellow countrymen politically, and protect them from the attacks of the Albanians and Turks, around the 30's of the 19th century, during the reign of Prince Milo§ Obrenovic, the principality of Serbia began giving financial support to the Serbian population in Kosovo. Those in circles of authority in Serbia did not remain indifferent to the outcries of the victims in Kosovo. Money for the reconstruction of monasteries and the building of schools was sent secretly through the monks and merchants; from the 50's, financial aid became constant, and increased in amount. In 1871, a theological seminary, which becames the center of religious and national happenings, was founded in Prizren by the merchant Sima Andrejevic Igumanov, who had acquired his fortune in Russia, through trade. Sava Decanac, a monk from the Monastery of Decani, was its first rector. Serbs from all parts of the Turkish Empire were educated at this seminary. In it were bred priests and teachers who kept up, as well as strengthened, national consciousness among the discouraged and disheartened people. The religious and educational activities of the people there were conducted through the seminaiy, which was under the direct supervision of the Serbian government. The Great Eastern Crisis (1875-1878), was an important turning point in the lives of the Serbs in Kosovo and Metohija. From being a distant Turkish province in which attacks upon Christians had become an everyday thing, to which Europe had remained indifferent, Kosovo and Metohija suddenly become the focal point of the conflicting interests of the Great Powers and the Balkan states. From 1878 to 1912, possession of the territory of Kosovo and Metohija meant havings dominance on the Balkans. In the war between Serbia and Turkey, in 1877-1878, the advance guards of the Serbian army managed to push through to Kosovo, liberate Gnjilane, and take Communion in the Monastery of Gracanica near Pristina. A special liturgy was held in the monastery in honor of the liberation, while a commemorative service was given in tribute to the heroes of the Battle of Kosovo. However, the celebration of the Serbs in Kosovo lasted but a few days. According to the agreements laid down in the armistice between the Russians and Turks, the Serbian units had to evacuate Kosovo. 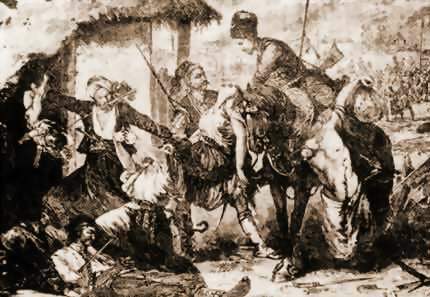 In 1877, approximately 30,000 Albanians retreated before the Serbian army which had liberated southern Serbia (Nis, Leskovac, Prokuplje, Vranje) and immediately began their revenge upon the Serbs living there. The Albanian Legion (1878-1881) was formed under the protection of the High Porta, prior to the beginning of the Berlin congress. Its purpose was to invalidate the war conquests of Serbia and Montenegro, to preserve the Turkish territory as a whole, and to present the demands of the Albanian National Movement before the European council. Being of explicit anti-Serbian orientation, the Legion started up a new wave of terror upon the innocent population, which, from individual acts of assault, grew into a movement for the extermination of the Serbs in Kosovo, Metohija, and neighboring areas. The Serbs become the main obstacle to further Albanian population expansion, as well as in the increase of feudal privileges enjoyed by their tribal heads. As a result of murder, and various other forms of pressure (blackmail, high taxation and fines, kidnapping of women, conversion of children into Turks, usurpation of estates), the emigrational flow moved towards the borders of free Serbia. From 1878 to 1912, around 150,000 Serbs from Kosovo, Metohija, and neighboring parts, found refuge in Serbia. The position of the Serbian population was becoming progressively worse. Around the middle of the 80's, a Turkish-Albanian coalition was formed under the guidance of Sultan Abdul Hamid II. Proclaiming pan Islamism as his principle guideline, "the bloody sultan" introduced his policy of giving in to the Albanians, who become his main weapon in the suppression of all Christian movements in Europe. Having become fanatics through pan Islamic agitation, the Albanians identified themselves, more and more, with the interests of the Turkish Empire. Acting as a human rampart in protecting the interests of the Islamic Empire against the territorial aspirations of neighboring Christian states, the Albanians were given the right to freely attack the Serbs, taking away their lands, cattle, and women. The murders, thefts, and blackmail reached such proportions that even the representatives of the Turkish law began to shudder at all the anarchy. Serbia attempted organizing a movement for the protection of the Serbian population, on several occasions at Port, but all her efforts, unsupported by the great powers, ended in failure. The Serbian consuls in Pristina, among whom were the writers Branislav Nusic and Milan Rakic, were amazed at the proportions the sufferings of the Serbian population had taken. Through their writing, they attempted to compensate for their inability, as diplomats, to do much for their fellow countrymen. Nusic writes a significant ethnographical work entitled: Kosovo: A Description of the Land and People (Kosovo: Opis zemlje i naroda), while Rakic, in Pristina, writes his most well-known poems: Simonida, The Deserted Church, Na Gazi Mestanu (Simonida, Napustena crkva, Na Gazi Mestanu). The anarchy created by the Albanians was encouraged by the Austro-Hungarians. In their plans to penetrate into the central areas of the Turkish Empire, the Albanians were to serve as a bridge towards the Bay of Thessaloniki. For this reason, the dual monarchy encouraged the Albanians in their settling of scores with the Serbs, urged them to hold out in their efforts to exterminate the Serbs. The Albanians became the breach between Serbia and Montenegro, the one which was to prevent the liberation of Kosovo and Metohija, and the uniting of the Serbs. At the same time, Albanian uprisings acted as a backlash in the tearing down of the already shaky foundations of the Turkish Empire. The unchecked anarchy in Kosovo, together with the terrorizing and genocide of the Serbian population, lasted, continuously, until 1912, when Albanians rebelling against the Young Turks, accelerated the forming of the Balkan Alliance. Realizing that a complete annihilation of the Serbian nation was imminent under Turkish rule, Serbia and Montenegro decided, along with Bulgaria and Greece, to make the decisive move. In the fall of 1912, in the war proclaimed against Turkey, the Serbian army, whole-heartedly encouraged by the belief that they were fulfilling "the pledge guiding all Serbs" - to free Kosovo, managed to crush the resistance of the Albanians and liberated Pritina, Prizren, and other cities of Kosovo, within only a few days. The Montenegrin army took over Metohija, together with Djakovica and Pec. The liberators were welcomed in Pec with the following words: 'You came at the last minute. If the war had been postponed for another few years, Serbs would have ceased to exist in these parts." The sight that awaited the Serbian army upon their arrival in Kosovo was more than sad. Territories which had once flourished, during the time of the medieval Serbian state, were devastated. Hundreds of ancient churches, fortresses and castles had been turned to ruins; the frightened and humiliated Serbs now wore the traditional Albanian dress as a protection against violence, while the narrow streets of Pristina and Prizren gave no indication of once having been Serbian capitals. However, not even such a sight as this could impair the happiness felt by both liberator and liberated at finally having realized the centuries' old dream of avenging Kosovo. Ema Miljkovic-Bojanic, Malcolm's Apology of the "Pax Ottomana"